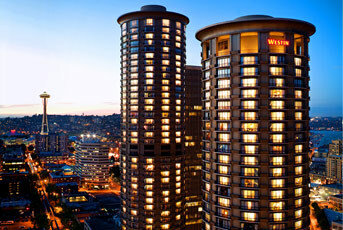 Consider the Westin Hotel Seattle if you're looking for a hotel located in the heard of downtown. Located right on 5th Avenue near great shopping and good eating, the Westin Hotel in Seattle is just across the street from Westlake Center and the Seattle Center monorail, which allows super easy access to everything at the Seattle Center like the Space Needle and the Science Center. So besides the location, what make the Westin Hotel Seattle worth staying at? Well, probably the best thing it has going for it is it's height. At last check, it had nearly 50 stories and is one of the tallest hotels in all of Seattle. This means that from most of the rooms you'll get an incredible view of either downtown, the Puget Sound, or even possibly the Olympic Mountains. Not every hotel in Seattle can boast those kinds of views! Plus, the hotel is cylindrical so the windows are curved. How cool is that?! What else you ask? Well, this Westin hotel is similar to other Westin hotels and includes all the usual amenities like a business center and a gym, but one thing that sets this Westin property apart from other hotels in Seattle is that it has a pool. There are only a handful of similar hotels in downtown that have pools, so if you're interested in taking your family to Seattle, and they want a pool at the hotel, I would definitely consider getting reservations. Plus, usually you can find decent prices. So I've never stayed in a hotel that has completely satisfied me and the Westin Hotel Seattle is no different. For starters, the hotel could use updating. You know when you go into a hotel and the furniture in the rooms is dated and the showers are less than optimal? Well, this was my original impression of the hotel room. That being said, though, the beds at the Westin are incredible (or horrible if you ever want to get out of bed since they're so comfortable!). The other big turn-off for me is the cost of parking. It doesn't matter whether you valet park or would rather self-park because either way it's going to cost around $30 - $40 per day to park. That's a pretty steep price even for Seattle, which is well-known for its horrendous parking fees. All in all, I would definitely recommend booking a room at the Westin Hotel, especially if you have a family and are interested in staying really close to downtown. The kids will enjoy the pool and you'll enjoy the convenience of everything that is so close by. Yeah, it might not be the most exquisite hotel in the area but it's great for what you'll need on your next trip to the area. Back from the Westin Hotel Seattle.